Ouch! Hope you’re on the mend now. That seems like a lot of damage for 3mm mdf but I guess it hit you at high speed. I hope I never find out. I have a very old belt driven table saw, usually if something goes wrong it just jams the blade while the motor keeps running and the belt slips. Still, can’t be too careful so thanks for the heads up. Might cause internal damage if it hit me, I don’t have as much padding as you 😀 Stay safe! Thanks Andrew, yeah, we are all good. Mending quick. Having a look st the underside of the MDF, and the saw really got hold of it. 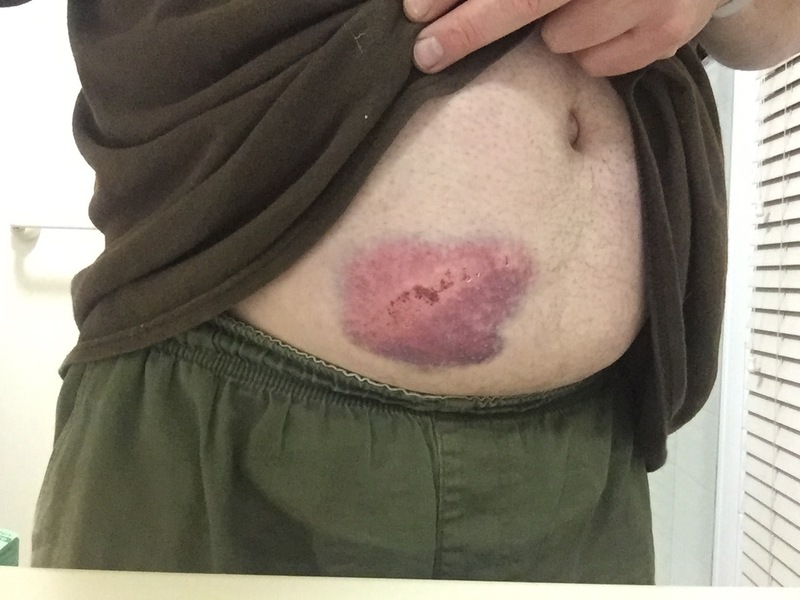 Yes, padding helped. It looks a lot more painful than it was. Still, whenever it happens there are lessons to learn (or re-learn). None of us are immune to careless mistakes. Both events can be contributed to a number of factors, with two first and foremost: incorrect practice, and a loss of concentration. blogs are difficult to maintain. we move, we change. How could a sub mariner explain that at sea? For one’s self, I get dusty and am not game to tackle Osage Orange via me bandsaw. My shed is good fun because I am still haven fun. Problem solving and haven fukken fun too… as well. Laughter is top-most..etc. And I say that because it is to your credit. I should remember your shed roof size and azimuth. Yep. I do. Difficult to fit a 5kWh solar. Did you have a dunny in ya shed? Thanks Stu. You’ll be fine. Thanks, yes, hard to maintain sometimes with all the competing demands. Having fun with what you do is critical, and I’m still enjoying it, even though the relationship with the shed has been changing. Problem solving is the most rewarding aspect woodworking, keeps the mind sharp, and focussed. The shed isn’t ideal for solar, but in my case I will be putting a full coverage up there, but rather than for power generation, it will be solar heating for the swimming pool. That has a secondary benefit of sucking some of the summer heat out of the shed. Some pretty impressive war wounds Stuart. 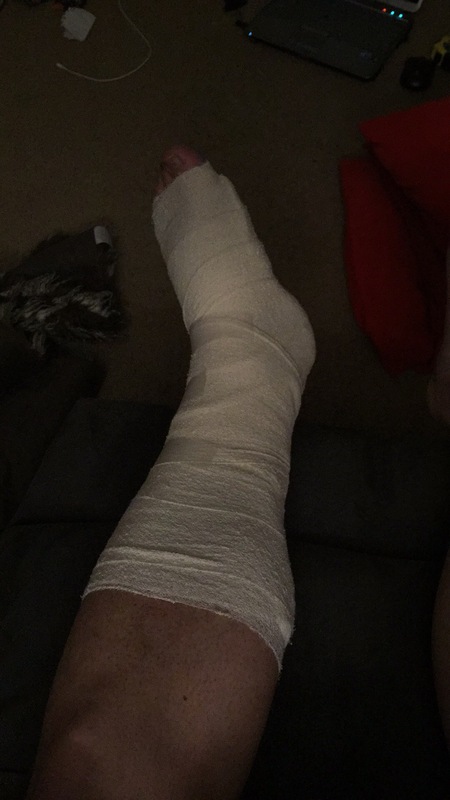 Back in 2007, I had an operation from a work injury, they gave me 6 weeks off to recuperate. After 2 weeks I was going crazy, so I went into my workshop and started making a bar for inside the house. When it was finished the neighbours helped carry into the house for me and helped to install it. That was a good enough reason to have a celebratory drink once it was all over. I bet you are using your time recuperating wisely and also thinking about your next lot of projects. Great to see you are OK. I try to abide by the principles of STOP THINK and PLAN but sometimes it is the simple things that go wrong. It’s easy to tell its fake if you know the printing technology of the time it is purported to come from. There are too many fonts used. Computers make it easy to change fonts, Linotype machines on the other hand used a magazine loaded with cast metal letters. To change the font involved lifting this very heavy magazine out and replacing it with another. It’s also too accurately set out, lines of type were assembled by hand. The reason line spacing is called leading is because blocks of lead were inserted to space them apart. Same for centred lines of type, you’d be cutting pieces of lead with a trimmer saw and spacing it by eye. The thing I miss from that era is the glorious parquet floors, had to have a perfectly smooth surface because the printing forme was assembled and then rolled on a cart to the stereotypers to cast the printing plate from. One bump could mean disaster with the biggest jigsaw puzzle you ever made in pieces on the floor. 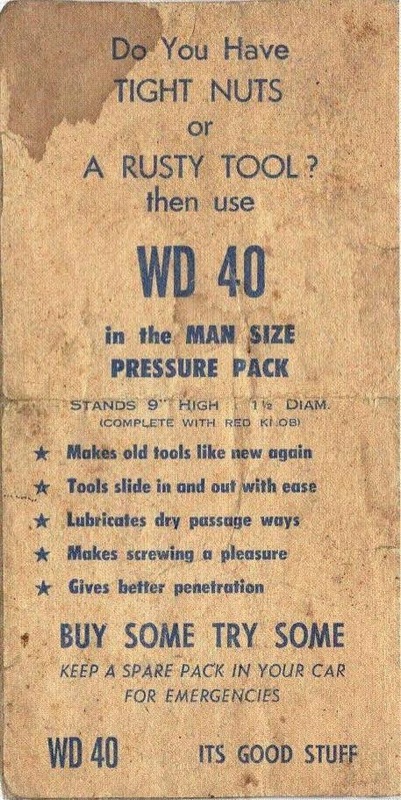 I don’t care if that WD40 ad is fake, it’s still funny. Reminds me of some of the fake ads the comps I worked with used to do at the paper (remember them? Newspapers, almost consigned to the dustbin of history). Half of them were so racist even Ted Bulpitt would blush. Times have changed thankfully. The injuries, I can sympathise. But we learn from them. I’m guessing your next pair of boots will have metatarsal protection – I had a pair given to me by my FIL who is a retired fitter, they were like walking around in concrete blocks but saved my foot when a 2700×900 sheet of 32mm MDF landed on it. If they hadn’t been 3 sizes too large I’d still be using them. Oh hell yeah! Didn’t know that was even a thing! You can get metatarsal guards that fit on any lace up boots from MetGuard and Kanga Tuff. Kanga Tuff you can get from Amazon quite cheaply. It’s more economic to buy these and reuse them when you change boots than to buy boots with metatarsal protectors.